The ability to act stupid and be told you're smart. Plenty and plenty of fair-weather friends. Oh and all the lovely stuff you want. I couldn't help chuckling at the caricatures of opulence. Everything about Tycoon Plus is tongue in cheek and sheer comedy. Tycoon Plus is a medium volatility slot with 30 paylines and 5 reels. The symbols are the tycoons with various signs of wealth: gold bars, money clip, checkbook, sportscar, credit card and briefcase There's also a bonus symbol of a dealers hand, but I'll chat about that a bit later. The controls are a bit different from the run of the mill game in that they are spread around the backdrop of a mansion. From the bottom left: Choose Coin, Bet Per Line, Select Lines, Spin and, perched on a sportscar, is Max Bet. Under the reels are your Balance, Credits and Bet amount. At the top of the mansion, you can find your Autoplay (with Turbo Spin option) and Paytable. Design-wise these controls are visual candy compared to what we're used to, so kudos to BetSoft. A small “fs” pops up occasionally on character symbols and if it shows on 3 or more of those tycoons, then you trigger the Free Spins Feature! (The amount of Free Spins you get depends on whether the Free Spins are activated on one or more paylines. )D During Free spins, one reel (2-4) becomes a wild reel and as a bonus, all character wins are doubled during Free Spins. Get the gold, money clip and checkbook in any order consecutively on a payline and you trigger the INSTANT CREDIT CLICK ME. Simply pick one of the 3 symbols presented and an instant win is awarded. 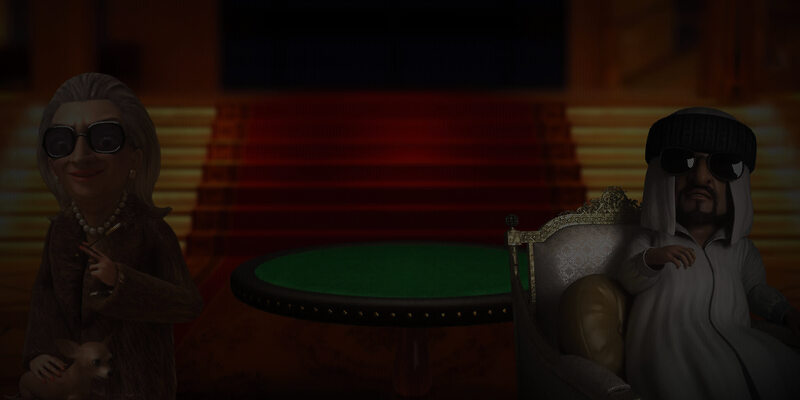 There's also a Bonus round – 3 or more dealer hands anywhere on the reels and you get to team up with a tycoon for a hand of poker. Choose your tycoon and if they win the hand, you win too! Finally, but certainly not least, there is a progressive Jackpot which is displayed chugging along on top of the mansion. 5 briefcases on a winning payline during a Max Bet will win you the whole caboodle! The complex animations and graphics are a treat. Despite theses processor hungry elements, I had no performance issues and Tycoon worked like the crème de crème of slots. The sound effects are hilarious, and even the music is amusing. If you are like me and thoroughly enjoy laughing at those who are financially better off, then join me in playing Tycoon Plus. It's a farcical riot with some incredible features. If you're part of the 1% - hmm well, hopefully, you can laugh at your brethren.